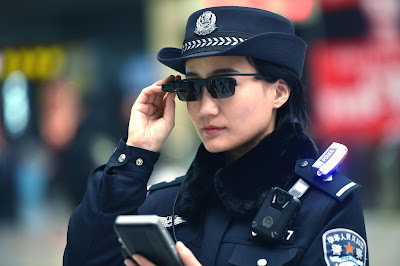 The Verge reports that China police is testing facial recognition glasses at train stations in the “emerging megacity” of Zhengzhou, where they’ll be used to scan travelers during the upcoming Lunar New Year migration. All these stuffs are, far or near, closed to some kind of corruption. It's a well-known technologies with the reliability that we know. So people try to push all kind of technologies to government for whom maintain of power is of upper most importance. Money will go to the pocket of some well-connected guys and the stuff will be forgotten and disposed in trash very soon ! I think this sort of technology is here to stay. I am not so happy about it but if it helps law enforcement arrest the right people instead of innocent people, that part would be good. As far as adoption goes, the technology is in a nascent state, and this is an early adoption period. Many limitations and places for improvement will be identified, and a next generation of the device will be better. Such automatic surveillance technology has been "predicted" and portrayed in science fiction for many many years...e.g., "Big brother is watching" in Orwell's 1984 written in 1949. Let's hope it is used wisely and kindly, and not to detract from our inalienable rights to liberty and pursuit of happiness. I do agree - this is here to stay. It is more frightning than cars because the danger is much more subtle and hidden. You can control the masses with such technology. Did you read about the social credit system just being introduced in china? You are reduced to one simple number. Below a certain score you dont even get a railway ticket. You are scored also for the people you interact with. This is the perfect means to establish dictatorship and keep opposition dead. But... maybe this is the way to keep mankind alive. Allowing people to chose freeely leads to all the environmental, social etc. problems that will really cause big changes the next century. China has demonstrated how to stop population exposion. Maybe they are the pioneer again how to stop mankind from driving the blue planet into a mess. But I doubt that the motivation is like that. Its about keeping power in the hand of the right people.